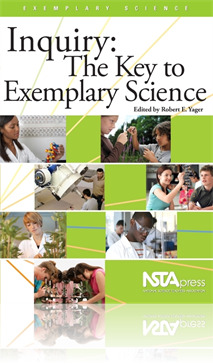 Science teachers aiming to foster inquiry in their classrooms will find the sixth title in the Exemplary Science monograph series, Inquiry: The Key to Exemplary Science full of helpful advice and new techniques. The 18 chapters in this monograph illustrate various forms of inquiry, offer detailed examples of planning and execution, and provide case studies highlighting successful implementation of inquiry. Student learning, development of positive attitudes, the ability to use concepts and skills in completely new situations are all demonstrated for use in your classroom. The National Science Education Standards call “for every student (every year) to experience the richness and excitement of knowing and understanding the natural world.” Editor Robert Yager notes that “in one sense, inquiry can be used as a synonym for science. Both include starting with questions, collecting evidence concerning the explanations offered, and arguing with others about the validity of the explanations. Science is a continuing quest for better understanding of the natural universe. This quest is inquiry! From the introduction to the postscript, the editor sets the stage on the importance of inquiry in the classroom. Each chapter is a case study on a successful inquiry-based program. The studies are written by teachers and for teachers on the what, where, when, how, and why of inquiry-based instruction. Any preservice or inservice teacher who wants to know about the different forms of inquiry will find a use for this book. The eight-volume Exemplary Science Series includes Exemplary Science in Grades PreK–4, Exemplary Science in Grades 5–8, Exemplary Science in Grades 9–12, Exemplary Science: Best Practices in Professional Development, Revised Edition, Exemplary Science in Informal Education Settings, Inquiry: The Key to Exemplary Science, Exemplary Science for Resolving Societal Challenges, and Exemplary Science for Building Interest in STEM Careers. Buy all eight together and save!